What do a hair salon and a dog trainer have in common – and I’m not talking about a poodle cut. Check out this logo process video to see what I’ve done for both of them. I work mainly with small business. I take seriously the trust they put in me to articulate visually who they are. The hair salon and the dog owner are both my clients and their brands have a very different feel. with customer service as the watchword. Are you a history buff? A Titanic themed Halloween party is just the ticket. I’ve designed an invitation that’s almost a replica of a first class ticket. I like its clean lines and elegant style. Here’s the original – the only surviving first class ticket! I did consider using the boarding pass, but in the end, decided I wanted less ornate, so went with the ticket. The boarding pass was used at a museum exhibit. 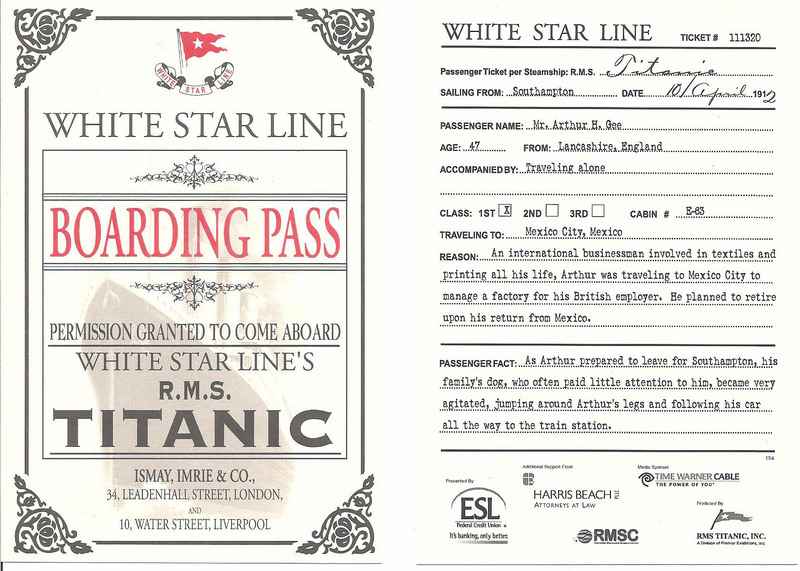 When you entered the exhibit, you were given it along with details of a passenger. At the end, you found out if ‘your’ passenger survived. 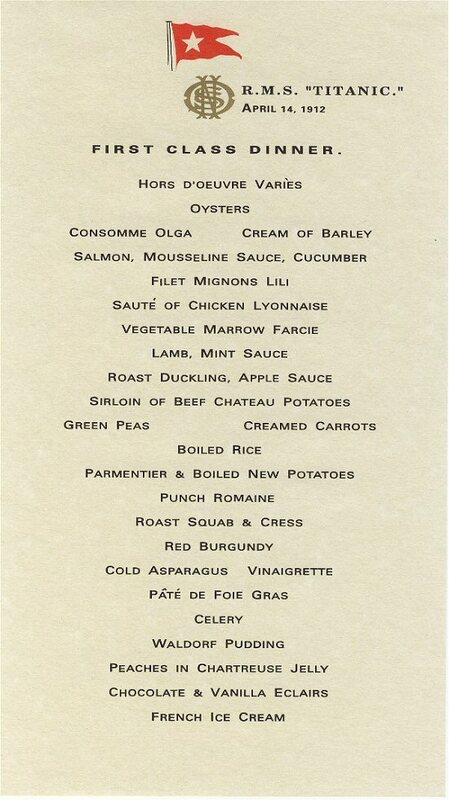 Thinking more about your Titanic Halloween party, you might like to have a menu similar to what was served on the Titanic – or perhaps not, as our tastes have changed. It was a typical upper crust Edwardian dinner, with many courses – exactly what the first class passengers would have expected. I even made a sample menu to whet your appetite. Have I got your Halloween juices going? You can download this Titanic party Halloween suite here, directly from my Etsy store or get in touch with me for a custom design. I am skilled at channeling your ideas so that your custom graphic design captures your spirit and articulates your vision. How do we collaborate to do this? I’m a great believer in putting our heads together when we start chatting about your graphic design. That way can explore what you’re looking for and nod enthusiastically when we’re steaming ahead or shake your heads when ideas veer a bit off the mark. Having an exchange like this really gets the juices going and ensures we’re headed in the right direction. If possible have a bit of a think before we get together so your ideas are in order. Perhaps your have a collection of visuals you like: you’re drawn to the color in this photo and the style of a particular logo, you like the type of typeface in this advert. Whatever it might be – bring it along and you’ll have a collection if images to show me that gives me an idea of where you’re headed for your graphic design. You might prefer to communicate your ideas with words. Tell me what’s on your mind. Lets explore your thinking, whether it’s fuzzy or in focus. Don’t panic – this is not a test and there are no right answers! It’s a freeform exploration of your ideas. We will go from there. I like our first discussion to be face to face so we can get to know each other and engage with the ideas together. But after that, questions about the graphic designs will come up and we will discuss the evolution of your project. How do you like to do that? Some people like to sit down and read an e-mail in their own time, mulling it over and absorbing the points. You might prefer to chat over the phone/Skype or meet up, getting to the heart of the way forward immediately. Chances are your ideas will evolve, which is why I put two edit rounds in our process. Don’s lose heart – it’s all part of how this works. I’m of the opinion that there’s every reason to spend time trying things and seeing what happens. That way we will be satisfied with what we achieve and avoid any ‘what ifs’. I’m here to create a long term relationship. I want my clients to have the best possible experience with me as we work on your graphic design. Let me know if you have other ideas to add to the smoothness of our collaboration. The Hecht’s Company Warehouse is an iconic DC building, an Art Deco gem. It was built by the Hecht’s Department Store and until recently had been in a sad state of deterioration. It is now being renovated – into apartments. What a change – soon people will be cooking in their homes where before a railroad moved goods across the warehouse. What would this all look like? A great jolt of excitement spread through me as I read an e-mail saying that the Art Deco Society of Washington had arranged a tour of the conversion – which was ongoing. The warehouse is a construction site, so I put on my hard hat and was absolutely enthralled. This conversion is flagship and sympathetic. Two people who worked for the Contractors took us round, and were extremely enthusiastic: as they said, doing a conversion for such a well-known building is a unique experience. How was it keeping the nature of the building – and even building onto that atmosphere? Structurally, a fair amount of the glass had to be replaced – I think they have five glass contractors. You can see from the full photo above that there’s a huge amount of glass, especially those bottle glass type windows. Corning found the original mold for it! They were able to cast new glass from the original mold and just pop it in. There were many tales like this. The lobby is wonderful with a huge, found art installation made from elevator cogwheels, furnace doors and other wonderful industrial parts. Looking up at it – it’s huge – gives a thrill. What could have been a better focal point for the lobby? The sculpture for the outdoor courtyard. The units themselves are almost all unique, using to full effect the warehouse’s own features. This is a bedroom. The units’ interior design is inventive – I love this metal pantry door, almost like a meat locker! They kept the concrete floor and buffed it up a treat. There are different size apartments and if you like, you can enjoy the incredible view from the top floor – and when it’s finished, you’ll have your own outdoor space too. How about a view of the fantastic design at the corner of the roof? I’m am intrigued and mostly delighted by the way warehouses are no longer crumbling but are becoming homes. I personally enjoy how industrial design is being interpreted in these conversions. Do you like industrial design or are you more in favor of warm wood? Whatever your vibe, let’s work together to create your glorious designs. I’m sure you recall the sophisticated logo design for Salon Gerard – the next challenge was business cards. We wanted to keep it simple and elegant. A crisp design that relied on the the typography and the logo fit the bill. On the front we added only a conical line, in the colors of the logo, to separate the logo from the business information. The back has the logo as a watermark behind the lines to write appointment reminders. Originally we had a border – but it made the card feel cramped. We stepped back, satisfied that we’d created an elegant, harmonious whole. Finally, my wonderful printer gave us samples on different paper – which to choose from all these delights? We all fell in love with the linen – an absolutely stylish look, and a marvelous feel in the hand. The linen elevates the sophisticated design. It’s touches like this that make all the difference, especially when it comes to business cards. The front and back create a harmonious whole that is simple and gives the feeling of effortless elegance – like Salon Gerard itself. What’s your brand’s feel – Salon Gerard’s is effortless elegance, and their logo and stationery capture that perfectly. Let’s work together on evoking your own brand. Want that mid-century look for you wedding but don’t take yourself too seriously? I love a bit of Mad Men, mid-century whimsy for a wedding. Color is so important in capturing a period feel. The sumptuous yellow and red evoke the feel of that period as does the pattern in blue. The angles and lines hark back to mid-century. The pattern is our playfulness. It includes a stylized couple dancing, rendered in simple line strokes. This couple could come from a cave drawing or be derived from African sculpture. At the turn of the Twentieth Century French post-impressionist artists lead the way in interpreting the aesthetics of African sculpture into their own art. The bold colors and stylized, flat figures helped define Cubism and Modernism. Picasso in particular showed the influence of Africa in his work. One of his most famous works Les Demoiselles d’Avignon is a stunning example of this. Sometimes the African influence was less pronounced but still palpable – like this Modigliani painting. Imagine the heady excitement of discovering these different styles and how that opened a new way of looking at things. The lines of African art can still be seen today – the influence of Africa and Picasso and the Cubists lives on. We wanted the wedding stationery to be beautiful but not take itself too seriously – this is the general vibe for the wedding. There was some fun conversation over mid-century table names and many laughs over the silly idea of naming them for I Love Lucy. Who would want to sit at the Fred Mertz table? In the end, famous movies held the day – and of course we had to have a cheeky Vertigo table. The fun tone extended to the response card with the regrets phrasing. Whatever the tone you set for your wedding, we can work together so your stationery embodies who you are. Respecting Artists – inspiration, copying and whose work is it anyway? A bit of a tricky topic today, one that can be quite confusing. As I develop my designs I often use an image or a style for inspiration. Sometimes I’m literally asked to copy an image. What’s the line between inspiration and copying someone else’s work? Every day we see all sorts of lovely images and want to share them. Perhaps there’s a gorgeous woodcut of a woodpecker and you promptly send it to your friend who’s enchanted. All this is fun and above board. I think most artists are happy to bring joy to people while enjoying this sort of exposure. It’s sharing their images for private enjoyment. Everything changes when commercial use comes into the equation – after all, this is an artist’s livelihood and their art makes their ends meet. Wedding photographers tend to give their clients low res images specifically for sharing on social media – this way everyone can enjoy them, but the low res makes it hard for some rotter to use them commercially and make money off someone else’s work. And that ladies and gentlemen is in essence what I’m talking about. There’s a person behind every piece of work, someone who’s been excited and who’s struggled to create what you’re seeing. It’s an individual artist trying to make her way. In my line of work even typography often belongs to someone. It takes great time and skill to create a beautiful alphabet. Yet sometimes I’m literally asked to copy an image. Perhaps the person doesn’t realize it’s copying or perhaps they don’t want to realize. This charming painting is Going To School In The Rain by Wang Ani. Its colorful style is the Jinshan peasant school of painting. An article outlines how Wang Ani has had trouble with people copying her work. It’s a moving story and one that should give us all pause as we admire and disseminate art. For these artists, connections and contacts are vital – most make their living from the sale of their paintings. Although the local authorities have promoted the artists in their Fengjing town village as an important tourist destination, it is not easy making money from art. And what is now making it even harder is the spread of fake peasant art. Fake Jinshan peasant paintings reportedly began to appear 10 years ago but the painters had hardly any recourse then, said Xi Jiping, the president of the Shanghai Jinshan Peasant Painting Academy. “We did win some court cases over fake paintings but the proceedings were so costly that though the artists won their cases they lost money. The costs of protecting copyright are too high for rural painters,” he told the Global Times. Let’s say we wanted to use these charming children on bicycles. What would the line be between copying and inspiration – or is there one? We’ll change the number of children? We’ll change the color scheme? We’ll make some of the children face the other way? You cannot copy the cheeky children in their colorful slickers on bicycles and say it’s not copying. This is the core of the work; it’s iconic, it’s the painting’s essence. What would be inspiration, you ask? You could have the children flying colorful kites for example. It keeps the fun tone, it keeps the upbeat style but it does not reproduce the core part of Wang Ani’s lovely painting. Let’s get inspired to make our own art and produce our own beautiful designs together. I’ll be giving the book today as a prize – It’s [Carlos Mota’s new book] called A Touch of Style (Assouline; $85) You can win it by posting the best idea for accessorizing a coffee table. What are the ingredients for a great vignette set up on this important table in your living room? Send me your idea and at the end of the chat I’ll pick one and we will mail you the book. Recently Carlos Mota was a guest on The Washington Post‘s weekly Home online hour. Games – beautiful wood games, something like a mini labyrinth. My father was Hungarian and my coffee table has a Transylvanian ‘trick box’ on it. It’s beautifully carved and people love trying to find the key and open it. Something meaningful that opens your heart. We keep the Tibetan singing bowl that we used at our wedding on our coffee table. Books of course! exactly !!!! objects with memories are the best. One of the trick box’s secrets. I couldn’t wait to get my hands on A Touch of Style – it is delicious. From the colors and texture of the cover each page is a finely chosen, individual treat. Just running your fingers over the lime green linen cover and tracing the imprint of the title gives a trill of anticipation. What inspiration is within! As room follows room and designer follows designer there is a rhythm – a cohesion and harmony – throughout the book, made particularly impressive by the differing design styles portrayed. These are two following pages – very different styles yet one leads well to the other. But I have to admit, I adore the inside front cover and the inside back cover. It’s like stumbling across an exquisite sketchbook with a wild range of inspiration quickly rendered. We find Calder and Rothko jostling with Hello Kitty. There’s a delicious plate of pasta along with a cheeky hen and her chicks all rubbing shoulders with an African mask. It feels like an intimate glimpse into someone’s creative mind. You can see these sketches here. Let’s delve into your inspiration to create a graphic design that captures your look and epitomizes who you are. A well respected journalist starts a new venture – a podcast featuring stories from the Arab and Muslim world. It specifically gives voice to people who have an individual tale of culture, religion, politics… and more. These are gripping voices, but ones we wouldn’t generally hear: Voices Unheard. We wanted a clean, black and white design for the podcast logo that fits the pared down style of her website. The logo also has to look good when displayed small on iTunes. We put the title Voices Unheard in the center of the podcast logo, making it seem spherical – emphasizing the global aspect of the podcast and also giving it depth. Symbolism is important, so we used the cuneiform symbol for sky or heaven – it also can represent God or Deity: Diĝir. This visually indicates that the podcast will cover many topics, from Muslims and Arabs all around the world, not just those in the Middle East. At the same time, Mesopotamia and cuneiform come from the Middle East representing how your culture and religion play into your identity, even as you travel and live around the world. What we’ve ended up with is a podcast logo design that is light and airy, yet has strong lines. It also has movement and depth. As an added bonus its beauty is steeped in symbolism. What do you want your design to say? There are many forms of expression – let’s figure it out together. Do you have a relationship with your home – with your possessions and home decor – that gives you joy? I mean a full-on ‘I talk to you’ relationship? Perhaps you should? I remember happily the excitement I had finding the perfect pen holder I described in this blog post. Recently I’ve been reading Marie Kondo’s book The Life Changing Magic of Tidying Up. In it she describes her KonMari method of tidying your home and home decor so you only have to do the normal maintenance cleaning and tidying. Her advice is first to keep only those things that give you joy. Send anything else on its way, with thanks, to somewhere it will be loved and not neglected. That’s another important part: have a conversation with your home, with your clothes, with your spatula even. Greet your home as you enter it. Thank your shoes for taking care of your feet as you take them off. You can even appreciate your sofa for being comfortable and the joy its design gives you. You’ll find a response in the atmosphere. My sofa, the corn maidens hanging above it and I had quite a fiesta when those fabulous cushions arrived from Lauren. I still feel the pizazz coming off that area of the room. Remember seeing them in this video blog? To some people this sounds wacky. To me it’s an extension – a refinement – the advanced course – of how I already feel. I’m not acquisitive. Some people get a jolt from from the purchase itself but find the object lives in a drawer, never loved. I’m not like that. Many of my clothes are perhaps on the elderly side: they are old, quality friends and I take good care of them. We greet each other and value each other. At this point, it will not surprise you to hear that I use a mid-nineteen eighties era Miele vacuum cleaner. It’s giving excellent, tireless, and uncomplaining service with barely a problem. It is a touch heavy, but I don’t mention that. We should surround ourselves with things we love. Marie Kondo argues convincingly that this will have a knock-on effect in our lives. Our environment is key. She asks us to visualize the goal for decluttering/tidying our home or home decor. This should be a concrete goal – not something vague like ‘serene’. You should visualize in-depth how you’d like it to look – describe it, hunt down home decor images that speak to you. In the end, you’ll have a detailed picture you’ve painted in your mind of how you want your home to be. I think this is true of other visual aspects of your life. I touched on this in the blog post I wrote on how your home’s decor can act as inspiration for graphic design. This approach will help me as we capture your essence in your graphic design. Let’s work together to do exactly that.